Blood is the fluid that circulates throughout the body carrying nutrients and oxygen to all the cells and tissues and at the same time removes waste materials and carbon dioxide. Monitor the effects of chemotherapy and radiation therapy. 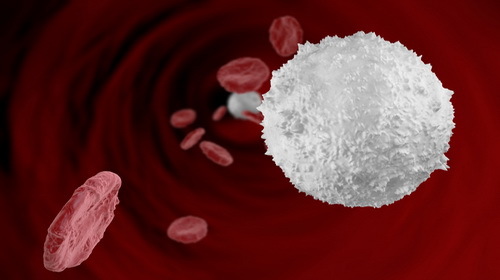 White blood cells, also known as leukocytes, play an important role in the immune system of an individual . They fight infections in a process known as ‘phagocytosis’ where they surround the foreign organisms and destroy them. White blood cells also help in the production, transportation, and distribution of antibodies in order to build the body’s immune system. When an acute infection occurs, the white blood cells produce colony-stimulating factor (CSF), which further stimulates the bone marrow to increase the production of white blood cells. This production can be doubled within a few hours. Therefore, it is normal and welcomed that when a person has a fever or some other systemic symptom, their white blood cell count is elevated. However, too many white blood cells doesn't always mean a good thing. A high white blood cell count (also called leukocytosis) isn't a specific disease but could indicate an underlying problem. This is why a high white blood cell count always requires further medical evaluation. per micro liter of blood. These counts serve as indicators to specific diseases. The differential blood count (sometimes referred as diff) serves as an indicator and gives a clearer picture of the cause of a disease. For example, a high neutrophil count would indicate an infection, a cancer, or physical stress while a high lymphocytes count would indicate AIDS . High monocyte and eosinophil counts usually pinpoint bacterial infection. Severe physical or emotional stress . Pregnancy in the final month and labor may be associated with increased WBC levels. Spleen removal could grant persistent mild to moderate increased WBC count. Healthy newborns and infants a have higher WBC counts than adults. Too much smoking could also cause an increased WBC count. The WBC count tends to be lower in the morning and higher in the late afternoon and they are age-related. However, when the white blood cell counts continue to rise or fall to abnormal levels it means that the condition is getting worse — scientists are still not certain if besides being a good indicator of a problem, high white blood cell counts could also trigger a serious disease if they naturally rise after an illness. An elevated white blood cell count always signifies your immune system is working harder than usual. This could happen simply because your body is preparing for pregnancy, or it could be your body’s response to a seasonal allergy, cold or flu, or even strenuous exercise and emotional stress. Your body is a very complex machine and when something is out of the ordinary it responds with something as simple as elevating white blood cell count. In very simplified language, your body’s immune system signals white blood cells – I am under stress, I need you to protect me better. And white blood cells start multiplying. White blood cells are the ones that also help in the production, transportation, and distribution of antibodies in order to build and protect your body’s immune system. This is why white blood cell analysis is a good indicator that something is happening within your body – this could be as serious as HIV or leukemia, or a perfectly normal response to pregnancy or a cold. One thing is certain though. You should not ignore your doctor's orders to have a white blood count done. It is a reliable and inexpensive way to enable better and faster diagnosis and prognosis.